Email disclaimers have been around for a long time, and for a good reason. Despite the ongoing discussion on their legal effectiveness and enforceability, legal teams insist on inserting them into emails. Disclaimers inform recipients about what they can and cannot do with the emails sent from your company. A humble request to inform the sender in case the message was intended for someone else will usually work. Thanks to that, you could e.g. learn that something is wrong in your newsletter subscription list or even save a deal after simply misspelling your client’s email address. If you have a task to create an email disclaimer or signature for your company and your mind went blank, fear not. We are here to provide inspiration. First of all, do not forget to insert your company’s data into the disclaimer. This serves more than one purpose. First of all, providing information on your company is required by law in some countries. 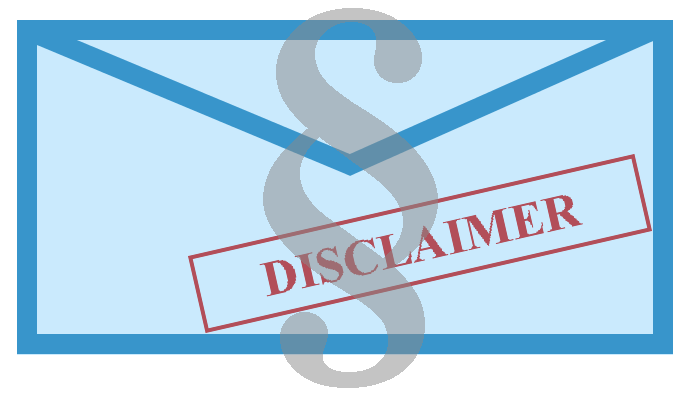 For more information on legal requirements for email disclaimers, please consult this article. Apart from the legal aspect, there is also a high marketing value. Including your company’s name and other information in every email makes your brand more and more recognizable and reinforces the bond between you and the client. This message has been sent as a part of discussion between [Sender’s name] and the addressee whose name is specified above. Should you receive this message by mistake, we would be most grateful if you informed us that the message has been sent to you. In this case, we also ask that you delete this message from your mailbox, and do not forward it or any part of it to anyone else. Thank you for your cooperation and understanding. [Your company] puts the security of the client at a high priority. Therefore, we have put efforts into ensuring that the message is error and virus-free. Unfortunately, full security of the email cannot be ensured as, despite our efforts, the data included in emails could be infected, intercepted, or corrupted. Therefore, the recipient should check the email for threats with proper software, as the sender does not accept liability for any damage inflicted by viewing the content of this email. No employee of [your company’s name] has the authority to conclude any binding contract without an explicit written consent of their supervisor. Therefore, any will to enter into an agreement must be confirmed by the [Sender’s name]’s manager. Those are especially important, as they deal with subscribers’ lists. According to regulations concerned with email spamming and privacy, you have to provide an easy way to unsubscribe from such a list. Are you perhaps wondering what could happen if there is no unsubscribe mechanism? Or if you do not provide information about your company? As an example, according to Canada’s Anti-Spam Legislation (CASL), sending a commercial electronic message within, from or to Canada without such mechanism can result in criminal and civil charges, as well as in huge penalties. For more information, you can visit this site. Below, you have some email disclaimer examples to show you how to put it into words. You have received this mail because you have subscribed for a newsletter at [your website’s address]. You can always unsubscribe from our mailing list, by clicking on Unsubscribe You can also reply to this message, including unsubscribe in the topic. Thank you for subscribing to our newsletter. [Your company name] team will work hard to deliver good quality information in the fields you have specified upon subscription. However, if you decide that you no longer want to receive such emails from us, feel free to click the link below. Click here to unsubscribe. Information included in this email is reserved to named addressee’s eyes only. You may not share this message or any of its attachments to anyone. Please note that as the recipient, it is your responsibility to check the email for malicious software. Finally, the opinions disclosed by the sender do not have to reflect those of the company, therefore the company refuses to take any liability for the damage caused by the content of this email. This entry was posted in Design, Microsoft Exchange Server 2007, Microsoft Exchange Server 2010, Microsoft Exchange Server 2013, Microsoft Exchange Server 2016, Microsoft Office 365 and tagged design, email disclaimer, legal disclaimer on January 20, 2017 by Adam the 32-bit Aardvark. Very helpful article, thank you for sharing! Disclaimers seem to have such importance when in reality they have no teeth at all…. for several reasons. First being that it cannot be considered a crime to receive something in error. Furthur to that, what a recipient does with that info is entirely up to them and unless the act itself is criminal (like fraud). Then benefiting from the info is also fair game. it is the equivalent of overhearing people talk while not actually spying and then acting on the talk. Bear in mind that many companies log all emails for various reason. Destroying all copies may not be possible for the recipient. There are many other fallacies related to Disclaimers that are easy to spot if you read into the meaning. Consider removing any threatening penalties or prohibiting “dissemination”. If the email contains criminal information such as “conspiracy to commit” The recipient would be compelled by “actual law to report it. Lastly remember that “Just because you say so” doesn’t make something a binding agreement. Maybe a polite request to delete and inform is all that is needed though most people simply do that as a matter of course. There are several good suggestions in this article that i liked. Your comment is brilliant Mike. Love it.. Odd that businesses feel a need to insert disclaimers at the foot of emails, yet they send out good old snail mail letters without any disclaimers at all. Disclaimers has now become nothing but a marketing statement. Great advice though and thank you. Disclaimer provides extra transparency to communication declaring terms is good.